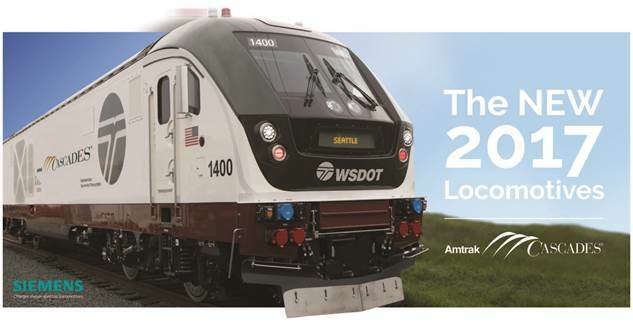 Here’s your chance to get up close to Amtrak Cascades newest locomotives and learn about WSDOT’s ongoing improvements to Cascades rail service. The new Siemens SC-44 Charger locomotive will debut at King Street Station tomorrow from 11 am to 3 pm. Photo opportunities and a commemorative souvenir will be available. The Charger emits less pollution, accelerates faster, is more reliable, and is safer than the locomotives it replaces. They are built in Siemens’s factory in Sacramento as part of a multi-state order for passenger locomotives, including the states of California, Illinois, Michigan, and Missouri. The new locomotives along with track and signal upgrades will enable two new round trips between Seattle and Portland to be added later this year. That is good news, too bad I cannot be there to see them. Hope you at least saw them passing through on the Empire Builder last week. Wish I could be there. List some extra swag on eBay please. Sorry, I didn’t grab any. I did not realize the hats were for kids when I first grabbed one for more practical purposes today. Fortunately I had another Amtrak hat with me that fit my head much better. WDTX 1403 and 1400 were the two locomotives present, being brought into the station by SDRX 923 as they are not officially in service yet. The locomotives wore WDTX reporting marks on the engines for the Washington State department of Transportation, so they will stay local instead of winding up in California like some of “our” assigned Amtrak power has. PR Failure. 11.20 no sign of this new loco, and not obvious how or where was to access the platform. It was on platform 9, which access was around the outside of the building and not through the station proper. Signage to the event was poor, as they needed signs inside the building which they only had signs coming from the south and outside for the event. I just took the tour about 30 minutes ago. The new Chargers look nice and clean. The new Talgos have been getting ridiculed for their “Underdog” appearance; these new locomotives have a very streamlined appearance. If they live up to their specs they’ll serve the Cascades service very nicely. The 2 new trips are confirmed for September but no one knows what the new schedule will look like. The Amtrak and WSDOT people I spoke to had no idea about when the new trips would be scheduled. Whatever happened to the Wisconsin Talgo train set? Do I assume correctly these locomotives are replacing the original Cascades locomotives from the 90s? Last I heard the Wisconsin Talgo’s were at Beach Grove in storage. Caltrans was looking at buying them or leasing them but I think that deal fell through. And yes, they will replace the Amtrak F59PHIs and Amtrak P42s that currently provide the power for Amtrak Cascades. I thought I heard somewhere that the F59PHIs were going to be overhauled and kept on the Cascades, and the cabbage cars scrapped. The P42s were supposed to be returned to long distance service. That of course, is only a product of the rumor mill.